Learn about Eugene and the UO. UO departments typically sponsor foreign, permanent faculty members for H-1B status. The H-1B visa category is a temporary period of employment for an individual engaged in a specialty occupation with bachelor’s degree or higher in a related field. The UO sponsors an average of 60 H-1B employees across campus, including professors, researchers, administrators and technicians. The J-1 scholar visa category was designed to enhance cultural and educational exchange between scholars in the US and abroad. The UO sponsors an average of 200 J-1 visiting scholars each year, who engage in a variety of activities across campus including teaching, research, language study, presentations and cultural activities. Information regarding alternate visa types for temporary UO employees. “The brain is a world consisting of a number of unexplored continents and great stretches of unknown territory,” said Santiago Ramón y Cajal, a Spanish neurologist from the early 20th century. 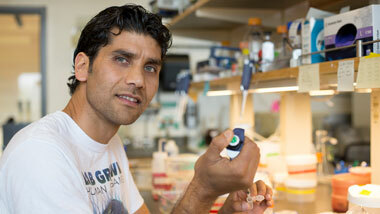 This is what motivates Mubarak Hussain Syed to work in neuroscience in the Doe Lab at University of Oregon. Syed grew up in a small village in Kashmir with his parents and two brothers. They did not have a phone or internet, and sometimes they didn’t have electricity. Learn more about Syed.